The school is serviced by a variety of bus companies that spread throughout the region. 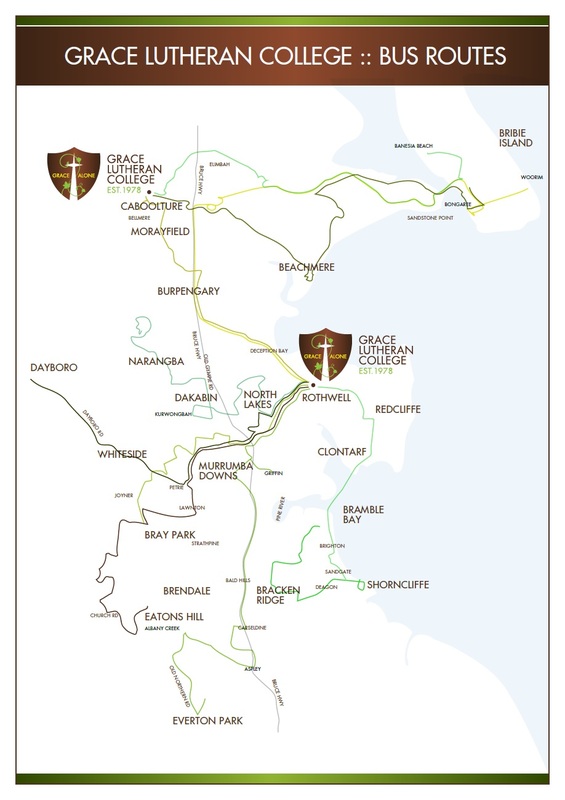 Private Grace College Bus Services are available to St Paul's Students and a smaller Grace bus is available for students who require movement between the St Paul's and Grace College Caboolture Campus for the purpose of parent collection and meeting connecting bus services. For information about bus fare and transport assistance schemes please refer to the information at the bottom of this page. Additional contact information: Ph. 3203 0066. Some students are dropped in Toohey Street, at the Grace Lutheran College car park, and walk to school along the linking pathway. There is also a gateway on the northern boundary of the school that allows pedestrian access from Parish Road. Many families choose to drop children at school by car. Car pooling is encouraged. St Paul's provides a bike rack for students who travel to school by bicycle. The government sponsored Bus Fare Assistance Scheme is administered on behalf of the non-Government school sector, jointly by the Queensland Catholic Education Commission and Independent Schools Queensland. Information on the School Transport Assistance Scheme as well as application forms can be found on the TransLink website.